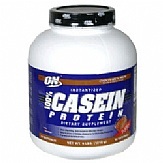 100% Casein Protein by Optimum Nutrition is a low carb and slow digesting protein. 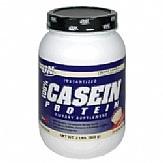 Slower is better when it comes to casein protein powders. The delayed release formula provides benefits that span longer than immediately before or after exercise, but throughout the remainder of the day. 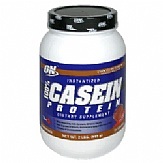 Casein is the most abundant protein found in milk and is considered to be one of the highest quality proteins because of its easy assimilation. 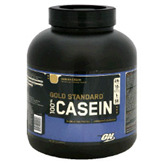 Casein supplies ample and sufficient amino acid quantities that the human body cannot synthesize on its own. 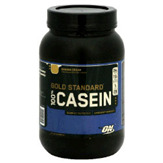 Casein proteins are pH sensitive and as a result form to a gel in the highly acidic environment of the stomach. Due to this pH sensitivity, caseins can take twice as long as whey or soy proteins to be broken down into an amino acid subcomponent. Casein protein powders contain time-released formulations and as a result can be used as an excellent nighttime protein. 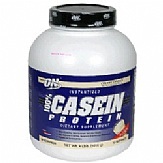 100% Casein Protein has a unique form and promotes anti-catabolic or muscle protecting proteins.